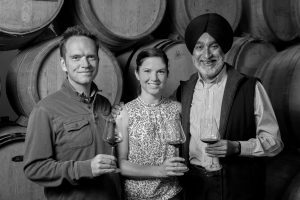 This is the first in a series of articles written by the people who make the wines & spirits that we proudly represent here at Skurnik. In our inaugural installment, Andrea Mullineux – winemaker & proprietor behind Mullineux, Kloof Street, and The Fog Monster – shares the inspiration and process behind the Mullineux family’s newest project; Leeu Passant, an exploration of Cape wine heritage and an homage to the pioneers of the South African wine scene. I spend most of my time in the cellar while Chris, my husband, is in the vineyard. We also travel to various markets and tell our story to the world. While on these trips we often get asked, “What is South Africa’s USP?” Since I am not a marketer by nature, I had to go and look that up. Unique Selling Proposition. I had not really thought about it for the whole of South Africa, although I felt that what we do in the Swartland was unique and special. When Chris and I started Mullineux in 2007, we were dead set on working with only the land and traditional vineyards of the Swartland, focusing on Syrah and Chenin Blanc (and Chenin-based blends) growing on the four fabulous and ancient soils of the Swartland. But what was South Africa as a whole about? Wine has been made in the Cape since the 1600s after the Dutch brought the first vines; the climates where the vineyards are planted vary quite a bit, and therefore so do the grape varieties and winemaking styles. In recent decades, many winemakers started following a world-wide trend of making bigger, more oaky, more alcoholic wines. This is what started the confusion. These wines were made in very international styles that were polished but could have been from anywhere. This realization set us on a mission to look back at the last century of winemaking, at the pre-modern style and at what wines were uniquely South African. We obtained as many wines as we could from the 1940s to the 1980s (the style shift happened in the 90s). Most of what we could find were from the classic brands Rustenberg, Alto, Chateau Libertas, and Lanzerac, and they were ageing beautifully. The fruit and tannins of the red wines were intertwined with spice and an incredible, viscous mouthfeel that gave a perception of sweetness, even though these wines were bone dry. These were fascinating and unique wines. A USP for South Africa. But how were these wines made? We tracked down some of the old winemakers who are legends now. These wines were almost never single varietal (and until the 70s the wine only needed to be 25% of a variety to be labelled so) but were blends. In fact, most of them were just labeled “Dry Red.” These wines were also Cabernet Sauvignon and Cinsault based. The Cinsault is where we reckon the unique perception of glycerol viscosity comes from as it ages based on older versions we have tried, and the Cabernet was the backbone. Why a Cabernet Sauvignon-Cinsault blend? Well, according to these older winemakers, it was originally for practical reasons! Cabernet Sauvignon in South Africa has tiny, pea-sized berries and the old equipment was very rustic and rudimentary, so the Cabernet would get clogged up in the system when they were trying to process the grapes. There simply was not enough juice. The answer, Cinsault (spelled with or without the “L” in South Africa). Cinsault has big juicy berries and was very prominently planted post-phylloxera due to its high yields to get the wine industry pumping again after so many vines had to be replaced. Cinsault was the lubricant, as they would process 1 basket of Cinsault for every 3 baskets of Cabernet Sauvignon, but it also tasted great together as a co-fermented blend. The farmers started planting Cinsault at the end rows of Cabernet Sauvignon vineyards so that they could be co-harvested together as well. A true South African style was born. These blends did not stop at just Cabernet Sauvignon and Cinsault, though. It became normal to blend in a third variety as well: usually Syrah, Tinta Barroca, or Pinotage. In 2012, a great opportunity for us to reinvent this style of wine came, when we began our relationship with the famed South African viticulturalist, Rosa Kruger. She was showing us amazing vineyards that were outside of the Swartland and were not Syrah or Chenin. 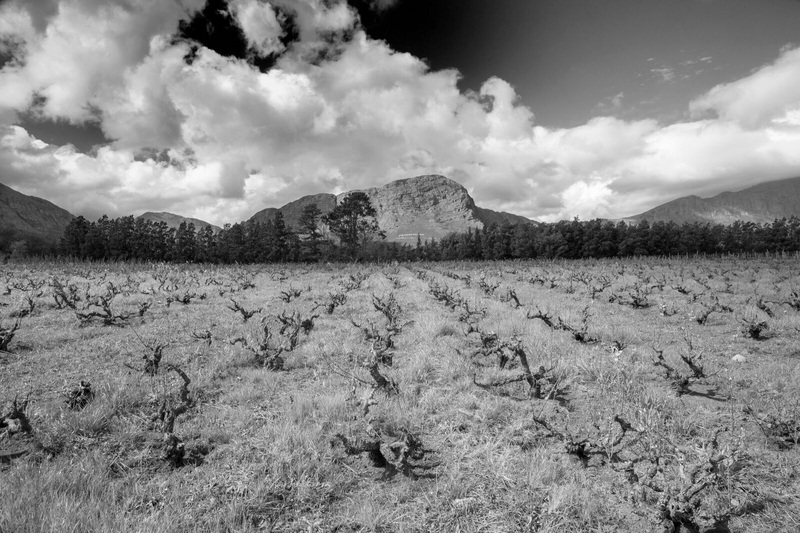 These vineyards were old Cabernet and Cinsault in areas like Wellington, Franschhoek, and Stellenbosch. These were OLD bush vines, up to 118 years old, some of the first post-phylloxera plantings. These vines were planted before there were cars or tractors in the country. These vineyards were planted skew and were only farmed by horse for generations. These vineyards had so much personality and were some of the original vineyards that went into these historic blends that we had been drinking. 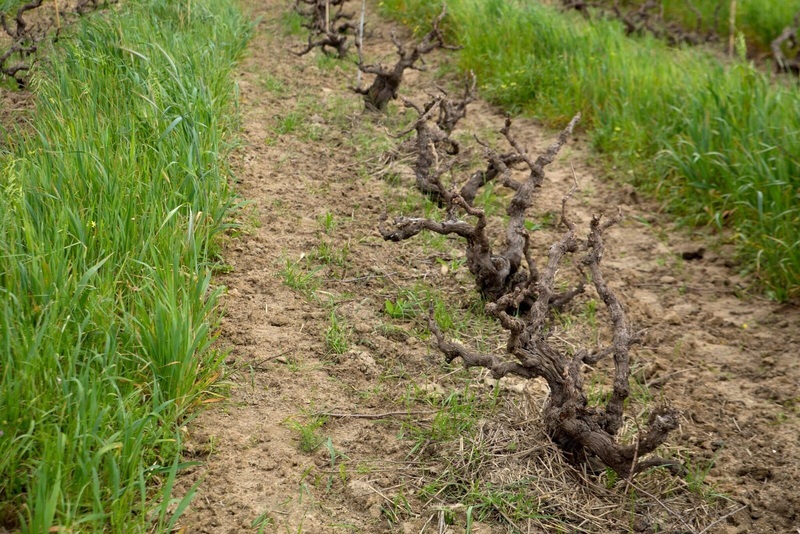 Most of the vineyards needed some serious help with rehabilitation. This was our chance to deconstruct what we loved about those old wines (the blend and amazing ability to transform in the bottle as it aged beautifully) and reconstruct them into our modern version; not with alcohol and oak, but with finesse and attention to detail. We also decided to blend in a third “modern” variety, Cabernet Franc. Now, although Cabernet Franc is MUCH older than Cabernet Sauvignon (it is one of the parents of Cabernet Sauvignon after all), it was relatively new to South Africa, planted only in the late 1970s for the first time. We drew inspiration on how to approach Bordeaux varieties planted in Mediterranean climates from Domaine Trevallon and Sassicaia while putting our South African touch with the Cinsault and tying it all together with our love of whole-cluster fermentation to enhance the aromatics, moving them from beyond the distinctive Cabernet Franc black tea character and pushing towards the bergamot driven Earl Grey tea. 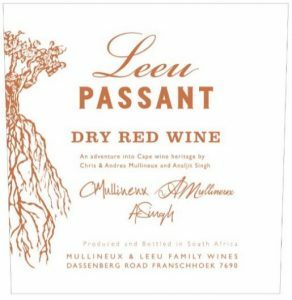 To pay homage to the old wines that inspired Leeu Passant (a name referencing us venturing out of the Swartland and rediscovering these old vineyards), we packaged it with a retro touch, even keeping the name Dry Red, but with a modern flair, just like the deconstruction/reconstruction that we used to approach the vineyards and winemaking. The final blend tends to be a third of each Cabernet Sauvignon, Cinsault, and Cabernet Franc. It is structured with fine tannins and incredibly aromatic. The wine evolves in your glass as it will eventually evolve in the bottle, showcasing the sweet and seductive fruit of Cinsault, followed by the spicy depth of Cabernet Franc and heartened by the framework of Cabernet Sauvignon. Following the decision to make the Leeu Passant Dry Red, Chris & I knew that we didn’t want to be a one-wine winery, so it was time to tie a broader story of the history of South African winemaking together. We wanted to make another wine that was not another version of what we were making for Mullineux, and had a beautiful tie in with the “deconstruction/reconstruction” theme we were using as a focal point for the red. Lightning struck when we were having dinner one night with a South African “Young Gun” whose father was famous for making Pinot Noir and Chardonnay. He brought a bottle of his father’s Chardonnay made in the early 1990s . This wine was not particularly old, but it was like nothing I had ever had from South Africa, which was going through a buttery, over-oaky, battonagy trend of the variety. This wine was austere, salty, flinty, and so full of youth and zest. If Chardonnay used to be made like this in South Africa, this is the kind of wine we wanted to make. Chardonnay was first planted in South Africa in the 1920’s, but was from a Clone that did not thrive and therefore did not gain in popularity until the 1970’s. 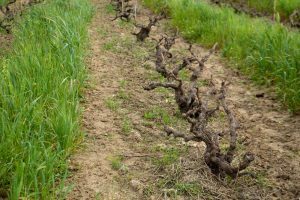 By then, after decades of poor viticultural and nursery practices, the clone was also full of Leaf Roll Virus and the vineyards had a shortened lifespan while producing compromised fruit. A couple of winemakers with a passion for Chardonnay decided to take matters into their own hands and smuggle cuttings of “Chardonnay” into the country. This first attempt was a complete flop as the cuttings were not from Chardonnay but were actually Auxerrios. The second attempt to bring in new, clean clones a decade later was a success, however, and the re-birth of Chardonnay in South Africa had begun. 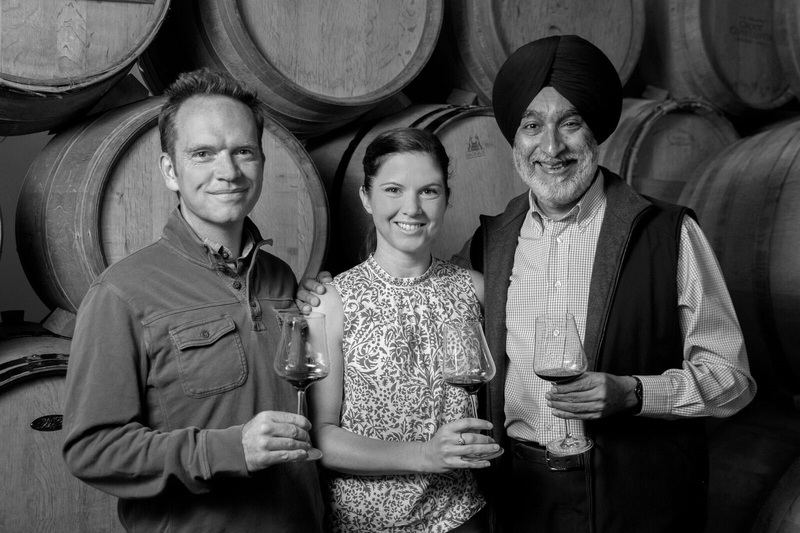 Chris & Andrea Mullineux and their partner in Leeu Passant, Analjit Singh. There are now about a dozen winemakers, including Chris & I, making historical red blends and wines like our Chardonnay that look toward the future of what South African wines stand for while respecting the past. A rising tide lifts all boats, and I think that there will be more to come, only strengthening this message. From one parcel of 36 year old dry farmed bush vine Cabernet Sauvignon planted in deep alluvial soils of Stellenbosch; one 115 year old dry farmed bush vine Cinsault vineyard (South Africa’s oldest registered Red Wine Vineyard) planted in deep sandy alluvial soils in Wellington; one parcel of 93 year old (SA’s 2nd oldest registered Red Wine Vineyard) dry farmed bush vine Cinsault planted on the lower eastern slopes of Franschhoek mountains; and a parcel of high altitude Cabernet Franc planted on the mid slopes of the Helderberg mountain in Stellenbosch. Grapes are cooled, whereafter they are crushed and destemmed into tank, and 25-50% whole clusters are added to the Cinsault and Cabernet Franc. Native fermentation takes place and the wine is pigeaged twice per day. The wines are racked and blended, aged in 30% new 225L French oak barrels for eighteen months, and then bottled. ABV 13.5%, pH 3.79. 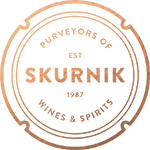 418 cases produced.